Charles – did you include any search/lookup functions ? As you are probably aware, the VLOOKUP function is likely the most abused function in the entire Excel suite of functions. On top of that, it’s very slow as well. I’ve seen Excel 2007 workbooks take up to 10 minutes to load because of out-of-control VLOOKUPs. Yes, the MEMLOOKUP and AVLOOKUP2 functions are substantially faster than VLOOKUP. They are also easier to use and more powerful. I have Fast Excel installed. Do I need to uninstall it to install Speed Tools ? Its OK to keep FastExcel V2 installed at the same time as SpeedTools. I agree that array formulas are often a major performance problem: thats why I spent a lot of effort building the FILTER.IFS family of functions to provide a faster alternative for many situations. There are still some Mugs and free licenses to be won, so if you have not submitted any feedback yet please do! I work with Excel 2013 PRO PLUS (because I need Power Pivot). 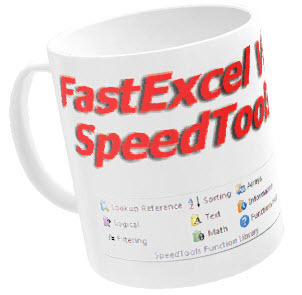 Can I install SpeedTools and FastExcel V2?